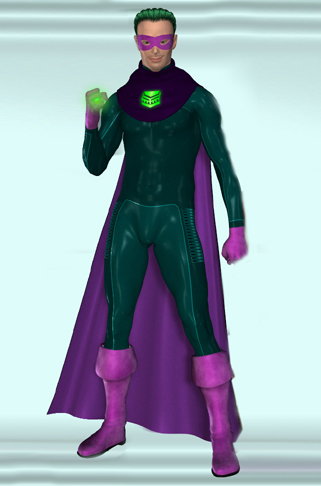 The Syman Sayz mask has been donned by several men since the supervillain’s creation. Max Indeks and some of his Metrobay R.O.P.E. friends came up with the idea to don costumes and amuse themselves with some perverted cosplay. Only this group of rich and powerful cosplayers had real supervillain weaponry. APEX labs had produced a tiny but high powered laser light emitter that when aimed at a thrallium crystal could turn the light ray into a hypno beam. Excited by the prospects of such an invention, Max Indeks had a ring created with one of the micro-laser emitters behind a thrallium crystal. Armed with the green hypno ring and a new costiume, Syman Sayz was born. The routine was that after a quiet dinner with his friends Max would don the Syman Sayz gear and in the streets reconvene with his friends. Only this time his friends were in costume as well. The first cosplay partners in crime were Madame Mynx ( Ava LaPette) and Trixtress ( Delilah Wellington ). Actual hired criminals would acquire some unwitting damsel and make her easy prey for the three costumed supervillains who would then satiate their perverse sexual desires with the young damsel. But, when real superheroines started to intervene, the cosplay game became more dangerous, yet even more arousing to the three R.O.P.E. fiends. Capturing real superheroines and putting them through naughty ordeals was incredibly arousing for the three masked villains. But when a couple close calls threatened to expose Max’s true identity, his wife Vivian demanded that he end his late night cosplaying. But, using the hypno ring in real world circumstances had allowed APEX labs to perfect their laser emitter technology. So, Max chose a new person to take over as Syman Sayz. Unfortunately, the new Syman Sayz kept getting captured and thwarted by superheroines. Max kept choosing new candidates, but each one turned out to be a failure. Finally, Max found Evander Greejus… known as E. Greejus. Greejus was an ambitious business major at Metrobay University. He had high hopes getting his masters in business and becoming an executive at a mega-corporation like APEX Labs. This was a young man who Max could control since Greejus would do anything to go up the APEX Labs ladder. Having his agents look into Greejus, Max was also gratified to learn that the young man was a closet pervert. Max could not be directly linked to Syman Sayz, so he had one of his minions offer Greejus the Syman Sayz hypno ring and costume. Ever since, Greejus has filled the Syman Sayz shoes very well. His first test was hypnotizing law student Brianna Baxter and setting her up as a bank robber. Now, Greejus wants Syman sayz to partake in bigger schemes… perhaps even become the leader of the League of Villains.